For other articles, see Knight Rider (disambiguation). 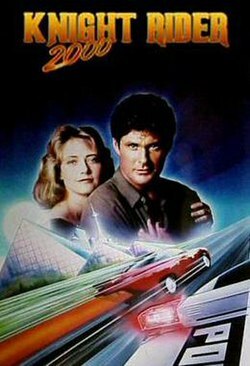 Knight Rider 2000 is a 1991 American made-for-television science fiction action film based on the 1982–1986 television series Knight Rider. In the year 2000, conventional handguns have been banned, with law enforcement carrying non-lethal "ultrasound" pistols. Nationwide budget changes have resulted in the adoption of cryonic suspension over standard incarceration for convicted criminals. Following the assassination of a mayor in San Antonio, his replacement demands a solution, which is found in the form of the "Knight 4000", a car that will become the next generation of the Knight Industries' supercar KITT. Thomas J. Watts is released from prison and assassinates the mayor. Police officer Shawn McCormick confronts the masked Watts holding the next mayor at gunpoint. She shoots Watts, who flees. The city's new mayor demands the gunman be found, while his councilmen reprimand him for disarming the police and setting up the cryo-prison where the inmates "sleep away" their sentences and emerge the same people as before. The Knight Foundation, created from a combination of Knight Industries and the Foundation for Law and Government, offers a possible solution – the "Knight 4000". Devon Miles and his partner, Russel Maddock, are green-lit on the idea, but the city wants to see a working prototype. Devon brings in Michael Knight as the test driver. The Knight 4000 has most of KITT's original features, but adds an amphibious mode that allows the car to drive on water, a heads-up display, and a stun device that can remotely incapacitate a human. Watts shoots Shawn after she discovers that some of her colleagues are working with the assassin to rearm criminals so the city will give the police their guns back. Doctors save Shawn by installing a microchip implant into her brain. She recovers, but cannot remember the details of the attack. Michael is furious that KITT has been dismantled and rebuilds KITT's AI unit, which is difficult since Maddock has sold most of KITT's technology to medical research. He reactivates KITT's logic module and installs him in the dashboard of his 1957 Chevrolet Bel Air. Shawn quits the police force after she learns her chief, Daniels, did not want to authorize her brain chip implant nor get involved in her case. She seeks employment with the Foundation, and Michael learns one of KITT's cybernetic chips is in her head. KITT links up with the chip and extracts her missing memories. Shawn remembers that Watts shot her and that her fellow officers were with him, including her partner. Watts learns Shawn is alive and sends the corrupt cops to eliminate her and Michael, who are chased down when they try fleeing in KITT. KITT helps them evade capture by driving off a pier where he quickly sinks. Michael and Shawn are safe, but KITT is damaged when water enters his circuitry. With Watts believing Michael and Shawn dead, he captures Devon and uses mind scanning technology to discover what Devon knows, killing him afterward. Michael and Shawn swim to safety and return to the Foundation, learning of Devon's death. After Devon's funeral, the mayor terminates FLAG's contract. Michael quits, but after Shawn confronts him, he returns and retrofits the Knight 4000 with KITT's AI. Michael and Shawn follow her former partner to a warehouse where guns are stored. Shawn arranges a gun transaction with her former partner. Before he can cooperate with FLAG's investigation, Watts shoots him. Michael saves Shawn from being killed. Maddock sends KITT a copy of the prison release papers for Watts, signed by the murdered mayor. Michael has KITT print more copies, sending one with a fake signature to Daniels using her name, and a similar one to the mayor, this time with his name. Following the mayor's limo, they record a conversation between the mayor and Watts discussing the papers. After ambushing a caravan of corrupt cops, they find no guns. KITT informs Michael there is another group of police cars headed for the local mall. Maddock convinces Daniels to allow KITT to pursue them. Watts has begun a transaction with a gun buyer. When one of the corrupt cops guarding Watts sights Shawn moving in, he shoots her, and the buyer and Watts flee. Michael catches up to Watts and disarms him. A fight ensues between Michael and Watts, Michael only stopping when Watts picks up his handgun. Shawn, only slightly wounded, arrives with the other handgun, instructing Watts to drop his. Michael talks Shawn down from shooting Watts. Watts then draws another gun hidden under his coat but Michael draws out an ultrasound gun and shoots Watts, who falls to his death. After Watts' defeat, the mayor is incarcerated, Michael returns to retirement, and KITT remains at the Knight Foundation with Shawn and Maddock. The trio continue their police work. Actor James Doohan makes a cameo appearance as an innocent bystander that KITT mistakes for a criminal stealing money from an ATM. KITT stuns the suspect and the man collapses. When Michael and Maddock pick up the man to arrest him, they find Mr. Doohan, delirious (from being stunned), and mumbling various lines from his role of Scotty on Star Trek. The movie served as a pilot for a proposed new series, but despite high ratings, the plan was abandoned. The theme song, "Knight Rider 2000", by Jan Hammer was released on his 1994 album Drive. Knight Rider 2000 was filmed in two Texas cities, San Antonio and Corpus Christi. In some scenes, characters are in San Antonio locations such as Paseo del Río and the Tower of the Americas one moment, and the next they are at the shoreline of Corpus Christi. The studio was unable to use the real Pontiac Banshee IV concept car for the movie, so instead it hired Jay Ohrberg Star Cars Inc. to customize a 1991 Dodge Stealth for the Knight 4000. The custom car can also be seen, albeit briefly, as a stolen supercar in CHiPs '99, and as a future police vehicle in Power Rangers Time Force. As well as being available as a single DVD, it is included in the Region 1, Region 2 and Region 4 versions of the Knight Rider Season One box set. ^ "Knight Rider 2000 - Knight Rider Wiki". Knight Rider Online. Retrieved 2011-02-18. ^ "Drive - Jan Hammer". AllMusic. Retrieved 2011-02-18. ^ "Pontiac Banshee (1989) with pictures and wallpapers". NetCarShow.com. Retrieved 2011-02-17. ^ "Knight Rider 2000". Jay Ohrberg's Hollywood Cars. Retrieved 2011-02-17. ^ "Knight Rider - Season One (1982)". Amazon.com. Retrieved 2011-02-21. This page was last edited on 9 April 2019, at 23:45 (UTC).